Looking for bike lights? Check out our Buyers Guide! A bike without lights is like a car without lights! Bike lights make for a clear view in darkness and fading light. Whether it's a front light or a taillight, good lighting is essential when visibility is poor. Both out in the countryside and on the road! So when you're on a grueling tour and darkness sets in... just turn your light on and carry on! A complete bike light set consists of a front headlight and a red light for the rear. Together with the appropriate reflectors bike lights provide a clear view of the road, but also make you visible to other road users. It is illegal to cycle on a public road after dark without lights, in fact in some countries it is illegal to ride without lights whether it's dark or not! Thanks to modern bike lights cycling fans can forget about the dim, flickering lamps of days gone by. Bright light, a long burn time and, most importantly, an independent power supply have turned the bike light into a real high-tech product. Bike lights these days really are capable of a lot, especially in terms of brightness. The brightness of a bike headlight is given in LUX or Lumens. As well as lighting the way, headlights can be used as a practical parking light when stopping on the side of the road or in case of a puncture. Some bike lights even feature a flashing light to draw attention in case of an accident. What different types of bike light are out there? The two basic types of bike lights are dynamo systems and battery-operated lights. Dynamo systems, as the name suggests, rely on a dynamo and only light up when the wheels are turning. Battery systems, on the other hand, are far more independent. 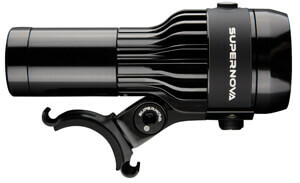 Modern mountain bikes and road bikes tend only to use lighting systems with an independent power supply. Front headlights are there to light the way. They are mounted on the handlebar and can be attached and removed in just a few simple steps. Taillights act as a signal. They make you visible to other road users in absolute darkness. Reflective elements on the wheels and the pedals further enhance visibility. Powerful bike lights by Lupine, Contec, CatEye, Busch &, Müller and other brand name manufacturers guarantee maximum safety and visibility in fading light and darkness. So, "Let there be light!"